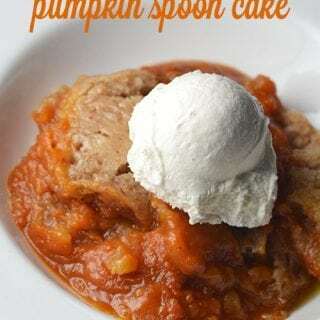 Slow Cooker Pumpkin Spoon Cake - Recipes That Crock! Are you looking for a delicious fall dessert to throw into your crock pot this season? 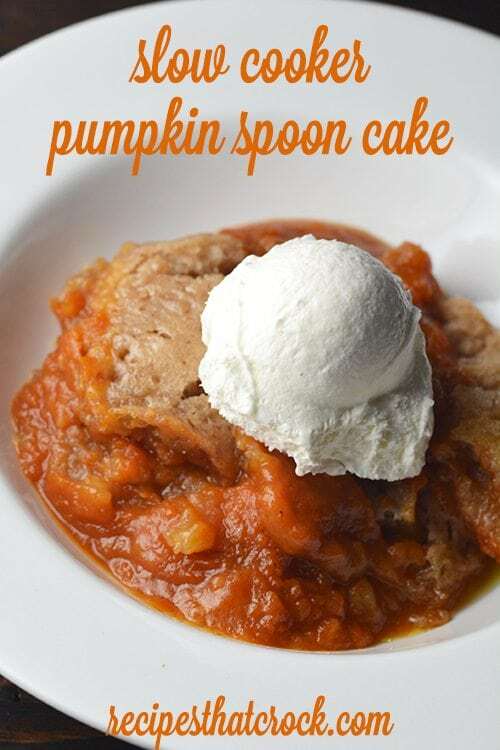 This Slow Cooker Pumpkin Spoon Cake is one of all time favorites. It all started with some Mini Dark Cherry Cobblers (from Gooseberry Patch’s Everyday Simple Suppers) that led to this delicious Peach Skillet Cobbler that eventually led to this ah-mazing Pumpkin Skillet Cobbler… which I became obsessed with because it was so good so I decided to convert it to a slow cooker recipe…. And that my friends is how this Slow Cooker Pumpkin Spoon Cake was born. We like this delicious “spoon” cake warm with ice cream or cool whip. We like it cold as is. We just plain like it. And, we think you will like it too! Now, we call this a spoon cake because it isn’t going to fully set up like our Slow Cooker Pumpkin Apple Cinnamon Cake. Think of it kind of like a cross between a pie and a cake. The cake will set up on top, while the yummy warm pumpkin filling will be perfectly spoonable for the most delicious fall flavor! As for my favorite slow cooker to cook this up, in it has to be one of my stove-top safe slow cookers because of their non-stick crocks which make clean up a total snap! In a mixing bowl combine the remaining ingredients except the pumpkin pie filling. Spoon pumpkin pie filling on top of the batter-- do not mix. Set slow cooker on high and cook for 1 1/2 hours OR until top cake is set. Note: You may want to put a paper towel under the lid while baking to catch condensation. This is my first time go to see at here and i am in fact pleassant to read everthing at one place. Do you mean “melt butter” in the top line of the recipe? My son likes only pumpkin pie, but not “regular” pumpkin. Do you think he’ll like this? Yes– sorry. Melt butter and yes to the pumpkin pie. It tastes a lot like pumpkin pie.